In another initiative, several of our research lectures will shortly be recorded, with slides, audio and video interleaved and the result expressed via our iTunesU site (in fact, I also tried a project along those lines in 1999, and the lectures are still visible here). Lecture podcasts are on the increase (inject directly into iTunes here to see/hear talks I gave on the topic of Wikipedia and iPads) and I have previously noted on this blog my thoughts about the future of (e)Books. A common theme of all this digital content is to maintain a balance between purely visual entertainment, whilst trying to also create re-usable and semantically-rich components. The movie above, informative as it might be, is largely meant to be entertaining (or engaging; I leave you to judge whether it succeeds in either endeavour). These blog posts (until this one), have concentrated more on the content than the style (although do note that I have been assiduous in running this blog with a mobile-device plugin so that it can be at least in part viewed in such a manner), delivering the former via Jmol models (and perhaps more of HTML5 in the future), with data-oriented information supplied via links to digital repositories. 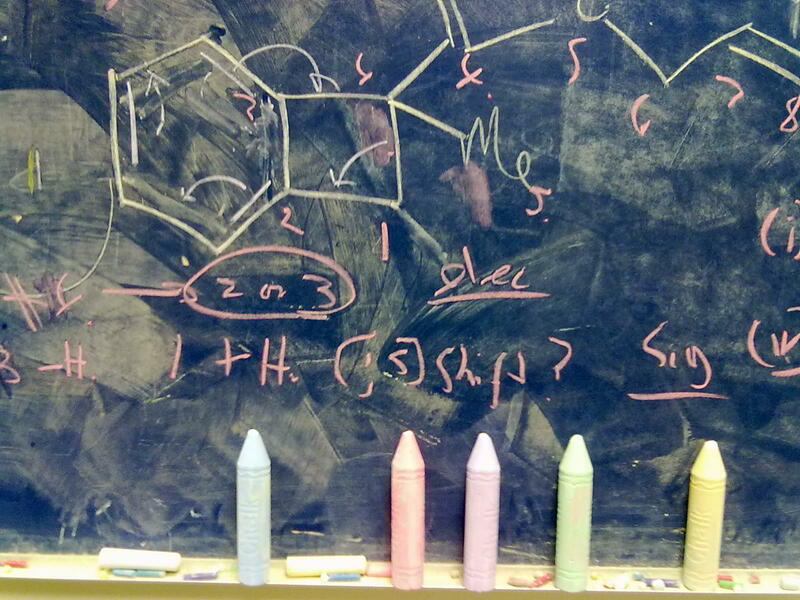 I am struck by the ever increasing contrast between “chalk-n-talk” (the photo below pertains to my office blackboard, and as you can see I do still love my chalk, thanks Greg!) and the (probably bewildering) variety of additional digital outlets we now have. How on earth does one cope? This entry was posted on Friday, May 27th, 2011 at 8:52 am and is filed under Chemical IT, General. You can follow any responses to this entry through the RSS 2.0 feed. You can leave a response, or trackback from your own site. I, for one, found the video thoroughly engaging. Thanks very much for posting it. My only quibble with it was that the legal stuff might be a bit too off-putting to someone considering starting a blog. Good to see librarians embracing new technology, they were after all one of the earliest forms of tech support.